Brimful Curiosities: Winnie the Pooh - A.A. Milne's Birthday! If those are these or these are those." I've loved Winnie the Pooh ever since I was a child. As a baby, I gazed at the Pooh wall hangings in my room. A friendly image of Pooh hovered above my crib, along with all of his friends. When we were little my brother and I often listened to a read and listen record of the Disney version of Pooh. Later on I read the classic. Winnie-the-Pooh and The House At Pooh Corner rank high on my list of favorite books. My copy of The World of Pooh is proudly displayed in our bookshelves front and center. Every so often, whenever I'm in the mood or having a "bothering sort of day," I take it off the shelf. Milne's stories bring such joy! It's time to get the book off the shelf again and read it to my kids for the first time. We've read other books with the Pooh character and they've watched a few Pooh movies, but we haven't read the classic together yet. I hope they love it as much as I do. I can't think of a better day to start than today on A.A. Milne's birthday. This summer we're also looking forward to watching Walt Disney's new Winnie the Pooh. It releases in theaters on July 15th, 2011. The hand-drawn animations look similar in style to those in Disney's The Many Adventures of Winnie the Pooh (released in the 1970s). Another reason I'm excited for the release -- Zooey Deschanel sings a version of the “Winnie the Pooh” theme song for this film! My daughter's kindergarten class had their very own Pooh parade and party last Friday. She dressed up in Eeyore colors and took along our plush Eeyore to carry in the parade. 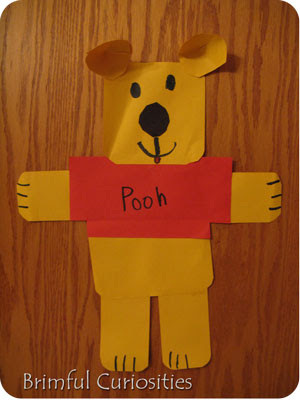 The class also crafted the cutest Pooh Bear art out of construction paper. Isn't it adorable? That's a very cute Pooh! I didn't know about the movie release - so exciting! What a darling little Pooh they made! Winnie the Pooh is such an innocent wonderful tale!